The way I originally finished was; from the "poor left hand hold" (obvious from the chalk in the photo) pull up and right to a sloper and then slap left for an OK hold on the lip, matching this and moving slightly left. Other methods may arise if an effort is made at cleaning some of the other holds. 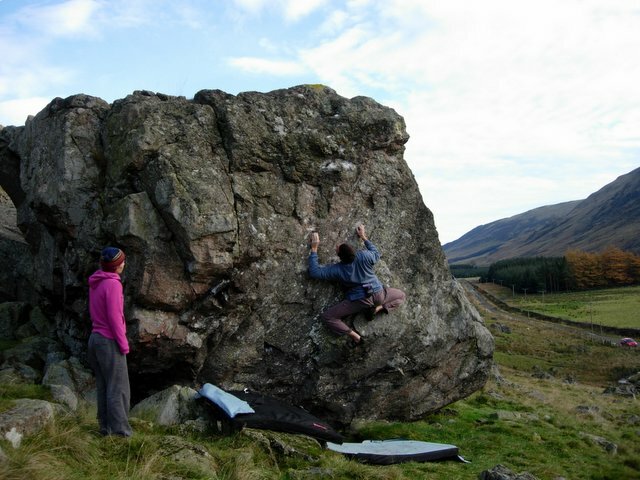 I though it V4 from standing, Dominic Kehoe probably did the first ascent from sitting and reckoned V5. Just one of plent of gems (climbed and unclimbed) lurking in Clova. One the way to the poor left hand hold is a tiny crimp that makes the move slightly easier, but the probelm has been done with and without it.